Why? Because the Postal Service caters primarily to the poor. It's been a truly bizarre and painful experience watching the budget negotiations between Congress and the US Postal Service. The USPS has consistently presented lifesaving ideas to an apathetic Congress that seems utterly unconcerned with saving a federal service that caters primarily to the economically disadvantaged and employs over 574,000 union members. In 2012, the postal service lost $16 billion, largely due to the 2006 Postal Accountability Enhancement Act (PAEA) which mandates that the Postal Service fully fund retiree health benefits for future retirees. This is the only time Congress has demanded universal health care coverage. It's almost hard to comprehend what they're talking about, but basically they said that the Postal Service would have to fully fund future retirees' health benefits for the next 75 years and they would have to do it within a ten-year window. Naturally, USPS suggested that this be the first provision to axe, but Congress hasn't pushed for a repeal of PAEA. Next, USPS approached Congress with the idea of suspending Saturday mail delivery, but Congress prohibited USPS from making that change. In short, the Postal Service has approached the government time and time again with ways to save itself, but Congress has rejected every idea. Well, a lot of it has to do with the whole catering-to-the-poor-and-employing-union-workers thing. House Oversight Committee Chairman Darrell Issa (R-CA) has been fighting to cripple the USPS under the guise of "reform" for years. Issa first went to war with the USPS soon after the American Postal Workers Union (APWU) and the Postal Service reached a collective bargaining agreement that would have guaranteed USPS over $4 billion in cost savings on employees over the life of a contract. At the time, Postmaster Patrick Donahue hailed the deal as a victory for the Postal Service, its employees and the people they serve. But then, as the union was preparing to vote on the agreement, Issa called a hearing on the contract—a completely unprecedented move. Here was a Republican chair of the Oversight Committee grilling the postmaster general about an agreement upon which a union was currently voting. Zlatkin called the move election tampering. 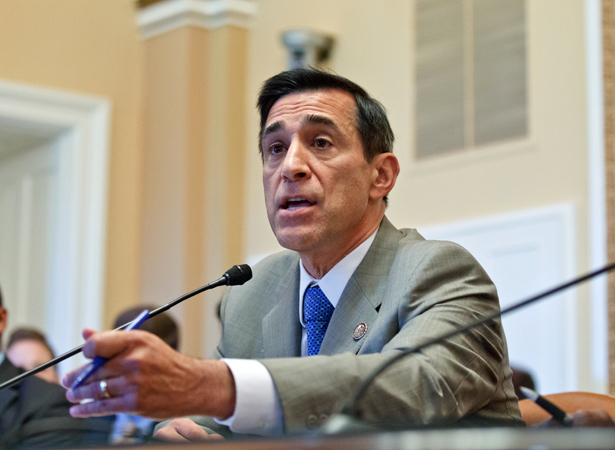 "The Postal Service’s decision to first pursue modified Saturday delivery and then renege on its cost-cutting plan has seriously set back efforts to advance postal reform legislation,” Issa said when announcing the hearing. He promised “to review a wide variety of options to bring the troubled agency back from insolvency." Issa has largely been successful in villainizing the Postal Service precisely because the USPS serves the poor and marginalized. Sure, wealthy Congress members, prominent bloggers and elite columnists probably don't use the Postal Service—they rely on FedEx, UPS and email—but millions of Americans (primarily the poor and elderly) still use the Postal Service. This week, the LA Times published letters from readers who thought the Times minimized the need for Saturday delivery. "Not everyone uses email, and the private delivery companies are much more expensive than the Postal Service. It seems there is a push to privatize every possible service run by the government," wrote Sue Roediger. "Agreed: The U.S. Postal Service doesn't exist mainly to provide jobs. But providing pretty good jobs is an excellent reason to maintain the service and six-day-a-week delivery," Frank Stricker wrote. The lack of passionate defense of the USPS is a direct result of the United State's two-tier society. Those of us who can afford privatized services like FedEx and UPS prefer those companies over the long lines at the post office. The fact that the caricature of the post office (long lines with only one teller at a single open window) is a direct result of budget woes doesn't really concern us because we can upgrade to more expensive services, while those left behind, i.e., the poor, make due with dwindling public institutions. Unfortunately, those who can afford privatized services wield all the power and hog all the media airtime, and so those who rely on public services like the USPS are under-represented in the national conversation about whether or not to save institutions like the Postal Service. And let's be clear: This isn't just an attack on the USPS. This is an attack on one of the country's last great unions. Privatized versions of the USPS, FedEx and UPS have been accused copiously of union-busting, not to mention FedEx's shady tax-dodging history. FedEx spent $8.7 million in campaign contributions and $71 million in lobbying expenditures form 2001 to 2010. It paid a .0005 percent effective tax rate recently, and spent a whopping 42 times as much on lobbying Congress as it did paying taxes by utilizing 21 tax havens. So we know what it looks like when mail delivery is treated as a business: Congress-approved tax-dodging, union-busting and price-gouging. Meanwhile, as the USPS scrambles to save itself, Representative Issa hopes for death by slow suffocation. Saturday mail is here to stay (for now). John Nichols explains why.